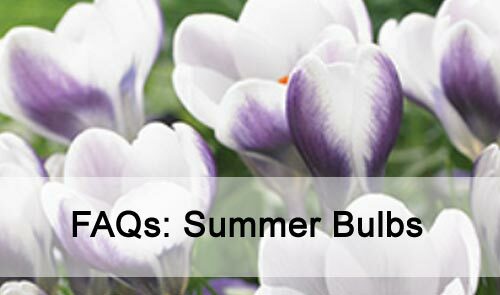 FAQs: Summer Bulbs This article lists frequently asked questions about summer flowering bulbs. My Lilies / Gladioli / Dahlias have changed colour, what do I do? Nothing! They don't change colour, it's a myth. What really happens is that weak varieties die out during unfavourable conditions (for example a wet, cold winter), and stronger varieties multiply. It appears the next season that some have changed colour because there are less of one and more of another, but that's not the case, it's just natural selection in action. Can you identify this dahlia? Well... there are literally thousands of dahlia varieties in cultivation. If it is one you have bought from us then we have a good chance of letting you know what it is, but if it's an oldie that has been in your garden for years or one you bought elsewhere then we may not be able to help. The most fragrant lilies of all are the Oriental and Double Oriental lilies. Next are the OT Hybrid lilies - hybrids between Oriental and Trumpet (Christmas) lilies. Next down the scale are the LA Hybrid Lilies with a sift fragrance - they are hybrids between Longiflorum (Christmas) lilies and Asiatic lilies. Christmas lilies have a soft fragrance, and finally, Asiatic lilies have no fragrance. What’s the difference between early, early-main and main crop potatoes? Early potatoes are specially bred for a very quick result and can be ready to harvest within 80 days of planting. Early-main crop potatoes are dual purpose - you can plant them early for a relatively early crop, or leave them to mature more and harvest them a little later, or even plant them later and grow them entirely as a main season potato. Main crop potatoes are exactly that, they're planted in mid to late spring and left to grow right through the growing season for an autumn harvest and loads of potatoes for winter storage. Are Hippeastrums and Amaryllis the same thing? No... and yes. Botanically they are quite different, but possibly because the word is less scary looking, Hippeastrums are widely and wrongly referred to as Amaryllis. So most of the time when some refers to an Amaryllis they actually mean a Hippeastrum and they using the wrong name. What’s the difference between seed potatoes and normal potatoes? They're both potatoes amd you can plant regular potatoes for your crop if you like. But seed potatoes are specially grown and certified disease free, so you know you're getting the best start possible for your crop.